My Veggie Girl Power Series Interviews, continue.. Every so often I will pop in with a new feature on an inspiring plant-based lady. Girl power galore. 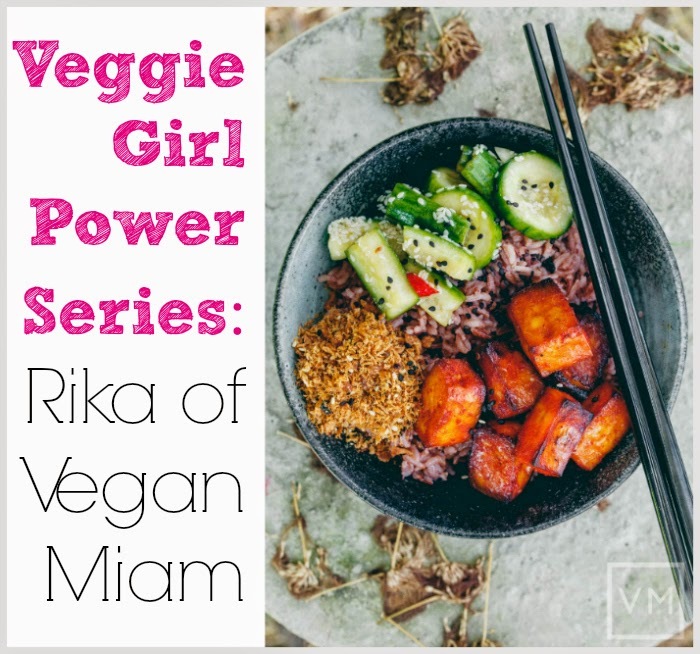 Today I chat with Rika, one of my fave vegan bloggers. Her blog, VeganMiam.com (VM) is not just about recipes and food, but also travel. I am always amazed by the exotic and awesome places Rika travels to. I wish I could shrink myself down in size and hop in her carry-on for a few months. She travels, runs her amazing blog and inspires us all alongside Doni her VM partner in crime. 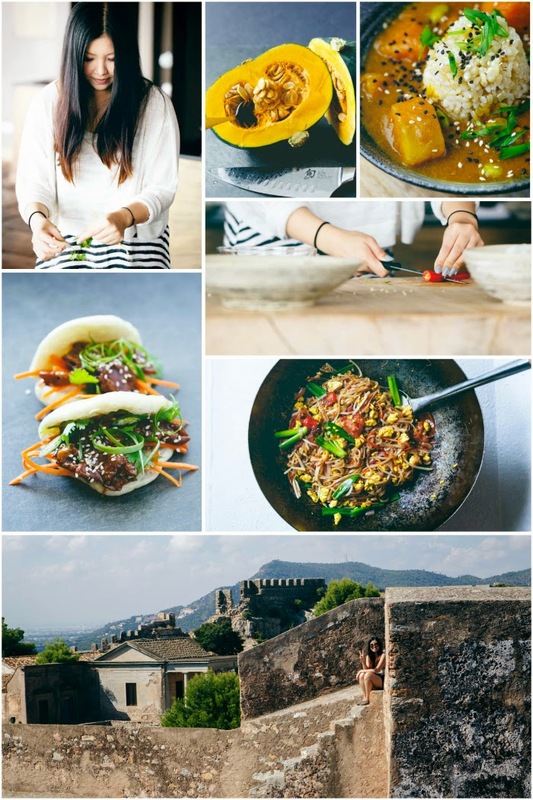 Check out my interview with Rika and learn about some amazing vegan travel destinations, recipes and more!.. Meet Rika. I am always so happy whenever I see one of Rika's blogpost submissions come through to FindingVegan -< I mean check out her beautiful gallery! Her food is always cravable and her travels inspiring! What a talented lady. 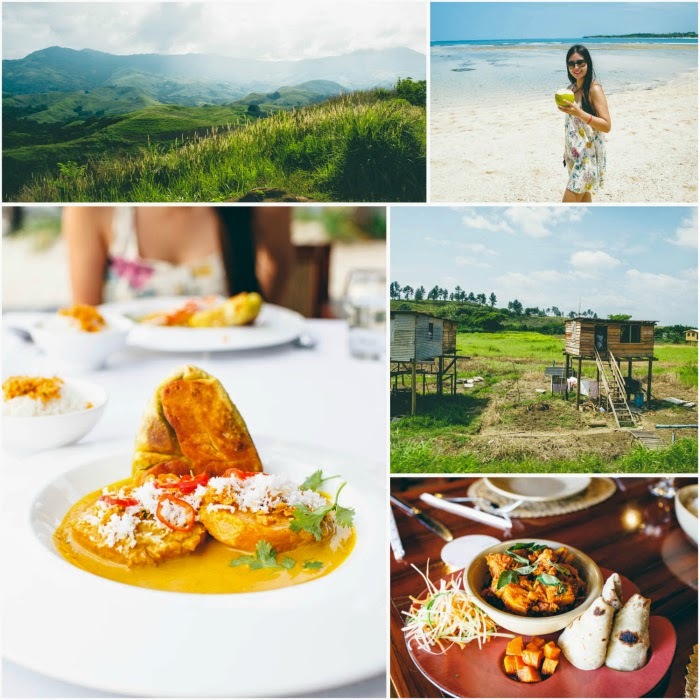 Her food and travel adventures are worth following! 1. Your Journey. When and why did you go vegan? I’ve been vegan since late 2006. Being from an island, I grew up in a seafood-centric family surrounded by fish, mussels and oysters. I have never been particularly fond of meat, so the transition to a vegetarian diet in adolescence was easy for me personally, even if it was occasionally difficult culturally. Exposure to animal cruelty and animal-testing videos helped to hasten my conversion to a vegan lifestyle. Along with having a vegan diet, I choose compassion and I choose vegan when it comes to my lifestyle. This includes my daily makeup routine, my toiletries, and my household cleaning products. 2. Your Work. What projects are you working on now? What can we expect from you in the future if all your dreams come true? I work as a creative designer and developer by day and night. I work in different time zones depending on where we are and in my spare time I’m in the kitchen where I create and photograph dishes inspired by our travels with my partner Doni. I have loads of upcoming recipes and travel posts to share, notably from Buenos Aires, Paris, Taiwan, Thailand and New Zealand. I’m a bit behind right now but travel posts can be difficult to cover. We look back through our notes for details on the foods, addresses and experiences. Looking back gives you a different perspective and it’s curious what stands out about the places we’ve been. Sometimes it’s the personalities and philosophies of the people we meet that we admire, other times it’s one particular ingredient that shines through as being distinctive and influential. More often than not though, we return knowing there are certain dishes we must recreate in our own kitchen. This year has been an especially busy travel year for us though and as a result we’ve found ourselves with a bit of a backlog. In addition to the backlog of travel posts, I would love to create a vegan Asian cookbook (both app & print) with a focus on Taiwanese cuisine. What many people don’t realize about Taiwan is that this is a country with a unique culture and cuisine to that of China, and historically speaking there is a distinctive Japanese influence on the culture and cuisine of Taiwan . 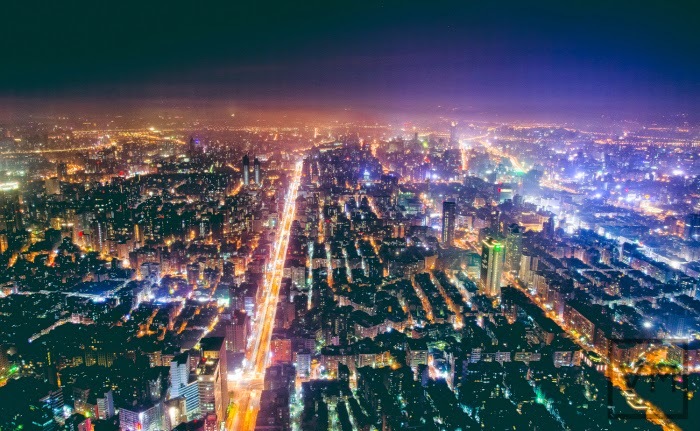 My experiences being raised in a Taiwanese household along with my personal travels to Taiwan as an adult have contributed to my knowledge and interest in this subject. This is a project that a lot of people have been pushing me to pursue and for which I have a great deal of passion. 3. Some Fun. Create a dream dinner party guest list. Who inspires you? Name 2-5 people that you would love to chat with for an evening. Where would you go, who would they be and what would you talk about? 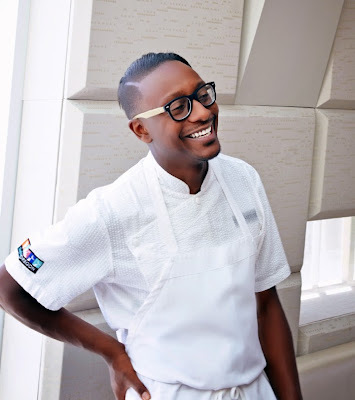 One of my Chef buddies in Portland, Departure Executive Chef Gregory Gourdet - he’s currently on the television show Top Chef - Boston and making us proud! He inspires me 100% inside and out. Trained by Jean-George Vongerichten, he’s pure, brilliant, laid-back, and to top it all off he has such a sweet personality. He has a way of making his dishes appear both intricate and simple at the same time. Focusing on fresh, rounded flavors and mind-blowing Asian cuisine, he’s always got a vegan option as well. We would naturally talk about Asian food, cooking, and so much more. Another guest at this dinner party would have to be Peter Dinklage, I have been a fan of his since The Station Agent and I respect him as an actor but also as a person for his views and support of vegetarianism. This decision wasn’t at all influenced by the fact that I love his character on Game of Thrones...of course. Lastly, I would love to have a meal with Stella McCartney - an individual whom I respect for her own personal achievements but also as someone whose parents have been so significant for vegetarians worldwide. I love her work as a fashion designer and respect how she has kept her values whilst succeeding in an industry that is notoriously inhumane. Of course if we’re speaking historical, dead or alive, dinner party guests then (as per the request of my partner Doni) Christopher Hitchens would join us since every dinner party needs an atheistic contrarian conversationalist. I would take this meal along any back alley in Taiwan, as so many locals do on any given night. Beyond the stinky fried tofu and tea-braised noodle soups, the food would be a blur since it’s the company that makes the meal. 4. Your Food. Describe your day of vegan food, what does one typical-yet-delicious workday look like? My one typical-yet-delicious workday dish is a rice bowl with fresh pickles, vegan ‘floss’ and something baked or roasted like our baked gochujang tofu or some harissa-miso delicata. It’s comfort Asian food - easy, quick and full of flavors. Lately I’ve been eating this almost once a week and it’s always tangy, spicy, sweet, and salty. This time of year, on a busy day I let my rice cooker and my Le Creuset put in the hard work for me. Homemade pickles are always a nice way to dress up a quick meal and along with the necessary seasonal root vegetables, squash and hearty greens, I keep harissa on hand to spice up soup bases, marinades, dressings and sauces. 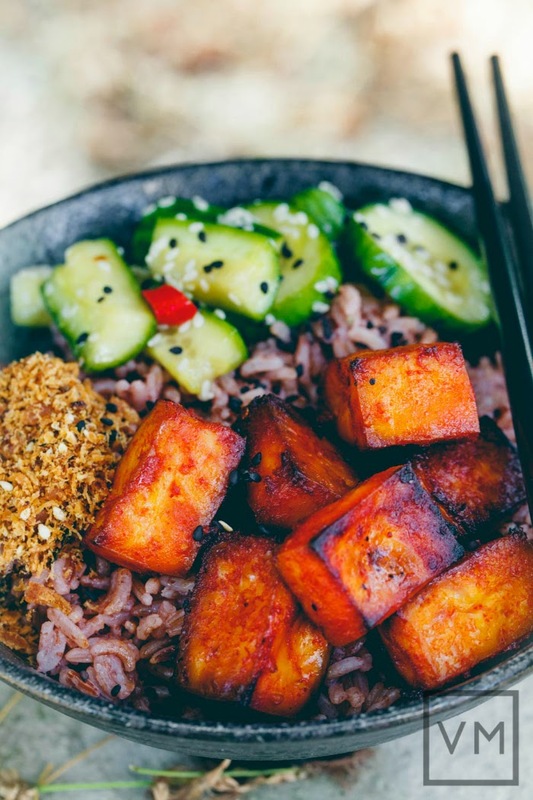 Get the ‘Gochujang Tofu + Pickled Cucumber Bowl’ recipe here. 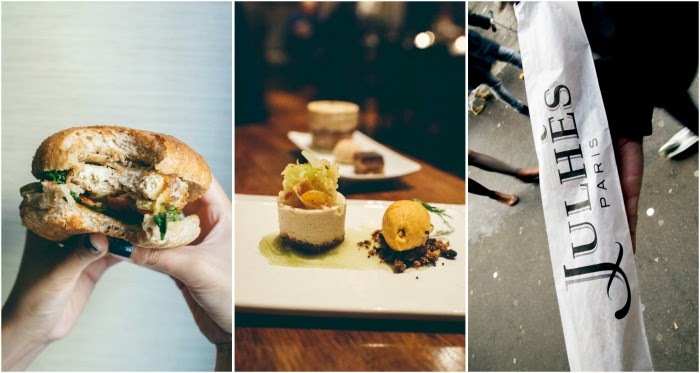 This year we discovered several places that haven’t received the appropriate amount of praise for their impressive efforts towards providing lovely local and fresh vegan food. There’s the Heritage Hotel in Auckland, where they offer a raw vegan breakfast, an exclusively vegan lobby bar menu and an extensive vegan menu for lunch and dinner including a vegan wine list. In Turin we found the most remarkable vegan and gluten free gelato at Il Gelato Amico. 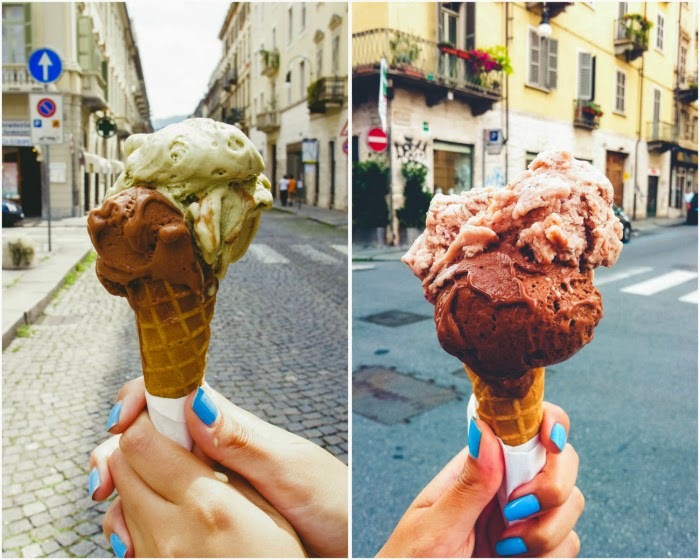 Nothing says Italy like a truly lovely gelato! 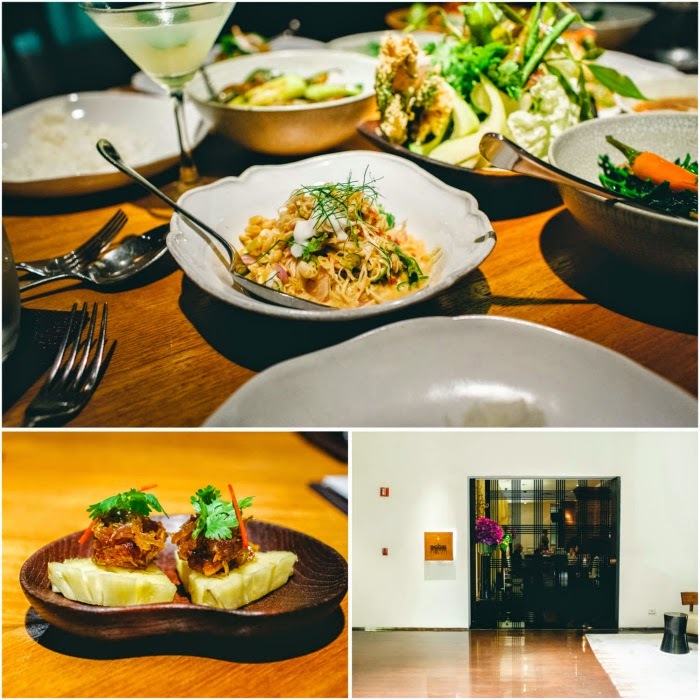 Lastly, we recently returned from a month in Thailand and we had the opportunity to dine at what is widely considered to be one of the best restaurants in Asia - Nahm. 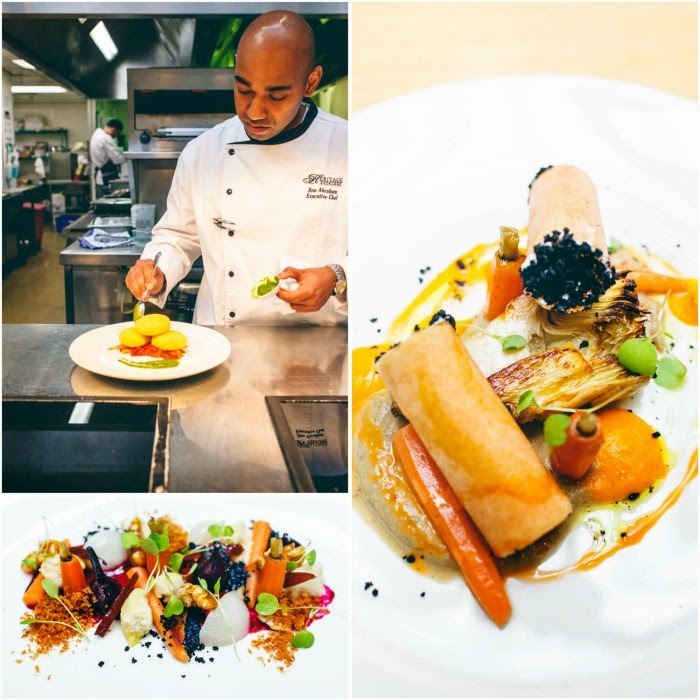 The attention to detail, attentive service and unique local flavors and techniques made for an unforgettable vegan dining experience. I would unreservedly recommend Nahm to any foodie visiting Thailand. Make a point of visiting Nahm for a change of pace from the lovely street food and for one exquisite meal. 6. Soap Box it. Any last words you want to rant about, we are all ears. Eventually we’ll settle down for a bit, but for 2015 we’re excited to have already made plans for extended stays in Cape Town, South Africa; Porto, Portugal; and Greece. All of this will come after spending the holidays in Melbourne, Australia. We make sacrifices to be able to travel but for the moment we’re happy to do it because we always meet the most remarkable people along the way, leave inspired by what we’ve seen and done and return with a greater passion for everything we do. We look forward to sharing all of our past, present and future discoveries from our vegan adventures with all of our readers at Vegan Miam. Check out our current travel schedule here. 7. Expert Question: Few favorite vegan destinations? 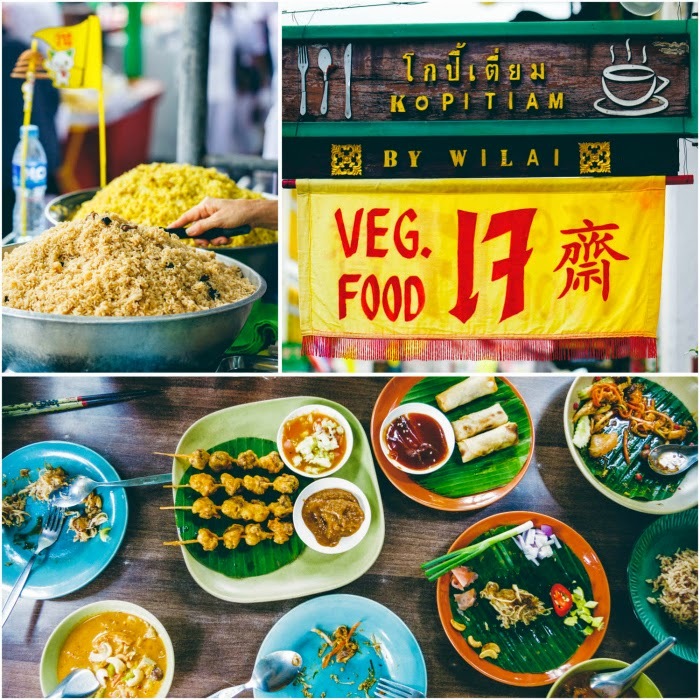 We always manage to enjoy wherever we are at that moment but Thailand is our favorite food destination. It’s affordable, tasty, culturally aware and open to vegetarian and vegan diets and the food is often made to order so even non-vegan restaurants are able to accommodate. For authentic Thai food, we enjoy Pun Pun Vegetarian in Chiang Mai and NAHM Bangkok, recently voted one of the world’s 50 best restaurants. Our trip to Bogota really surprised us in the best possible way and the food had a lot to do with that. 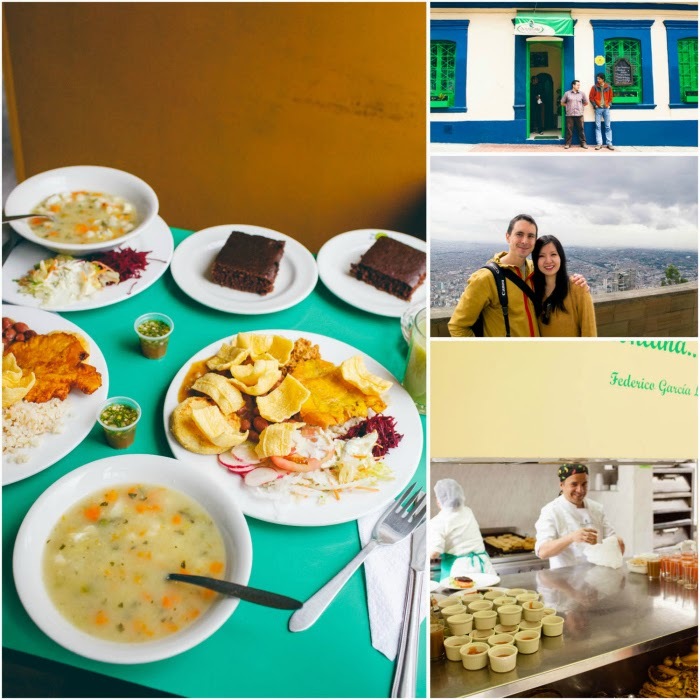 The vegan Colombian cuisine in Bogota always featured a lot of fresh, seasonal and lovely local ingredients along with plenty of hearty comfort foods like delicious empanadas and a variety of plantain dishes. The people could not have been any friendlier and the vegan food was some of the healthiest we’ve had anywhere. Valencia (Spain) had more grocery options than anywhere we’ve been, Paris [ http://veganmiam.com/category/europe/france ] always has the best breads and a wealth of options at the markets, Philadelphia never disappoints with HipCityVeg and Vedge and lastly Turin, if for nothing else than to stop at Il Gelato Amico for its divine vegan and gluten-free gelato - you must try the decadent gianduja gelato. The best vegan meal we had was the Pumpkin Curry with Brinjal Roti, made vegan upon request, from Flying Fish Fiji at the Sheraton Fiji Resort. We contacted the property prior to our stay to inquire about their ability to provide vegan options during our stay and we were impressed by their ability and desire to accommodate our needs and provide a variety of options. Combine the special efforts made to accommodate us with the delicious ingredients and the beachside sunset ambiance and we would be hard pressed to ever recreate this special meal. Thank you Rika!! Follow Rika online..
VGP Interviews. My VGP series is all about love, celebration, discussion and inclusion. If you have someone amazing and inspiring in the vegan community who you would like to nominate for my interview series, please let me know in the comments. Check out all my VGP Interviews here - Marilu Henner, Heather Mills, Portia de Rossi and more.